A professional landscape gardener offers a practical home landscaping guide which covers everything from pruning to renovating overgrown yards, designing new landscapes to maintaining existing ones. Illustrated. Turnbull, founder of Plant Amnesty, a group dedicated to eliminating "green meatballs," "poodleballs," and other bad pruning practices, emphasizes the use of selective, "rehabilative" pruning to improve overgrown and neglected yards. 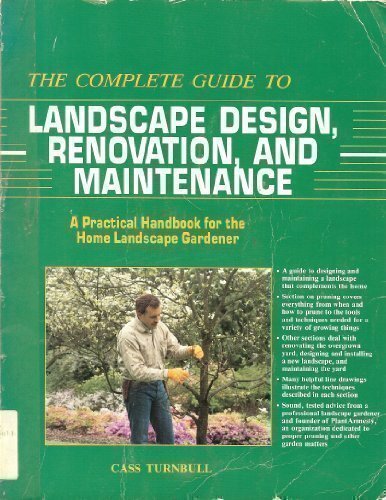 He devotes more than half of his book to presenting clear instructions and philosophy for pruning. Turnbull's good, basic information on the design elements that make a yard look good or bad and his tables of plants will help do-it-yourselfers make the right choices. He also includes plenty of practical labor and plant-saving tips. Wittier and broader in scope than Bonnie Lee Appleton's excellent Landscape Rejuvenation ( LJ 6/1/88), Turnbull's book will complement more expensive landscape style books like Better Homes and Gardens Step By Step Landscaping (Meredith, 1991. $29.95). - Peter C. Leonard, Mt. Lebanon P.L., Pa.